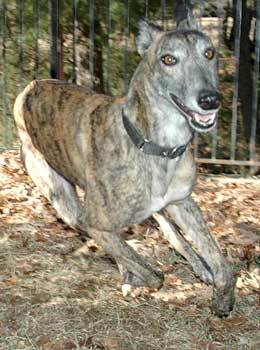 Ellen is a beautiful, vibrant 4-year-old dark brindle female, born October 2000. She is double tattooed, so her history will remain a mystery. Ellen and Kourtney were found as strays at a favorite dumping ground in a suburb of the DFW area. Ellen is in far better physical condition than Kourtney and is definitely the outgoing one of the pair. 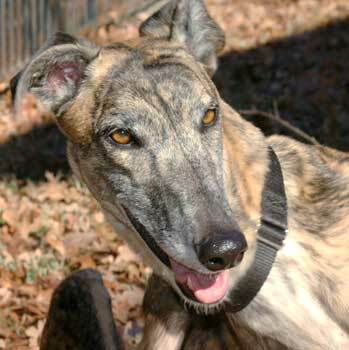 Ellen has never met a stranger and is a confident, affectionate girl. 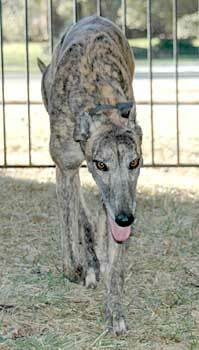 Her tail is in a constant wag, as if she is saying Hello all  my name is Ellen - I want to be your best friend! She has an exotic look about her that puts her in a league all by herself. It is not known at this time if Ellen is small animal or cat tolerant.